Pre-order from Game Stop here. Search on Fry’s Electronics here. See Best Buy listing here. 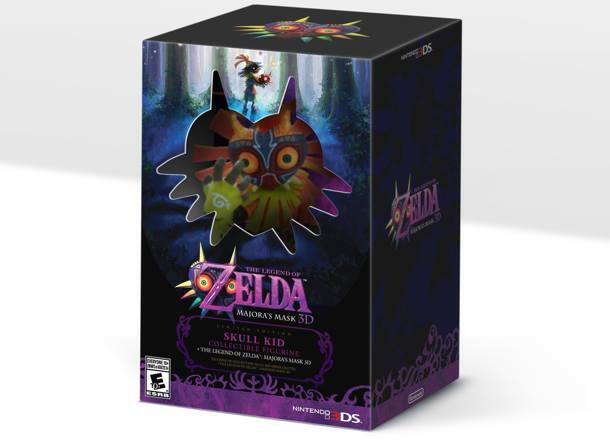 Nintendo of America announced this morning that a limited edition Majora’s Mask for the Nintendo 3DS will be coming to the U.S. The limited edition will retail for $49.99. The announcement didn’t come with much details about the figurine itself. But as the limited edition case is similar in style of the Wind Waker bundle (2013) which included a five-inch statue of Toon Ganondorf, it’s safe to assume that the figurine will be highly detailed and high quality. According to series producer Eiji Aonuma, the 3DS remake of Majora’s Mask will be more accessible to newcomers than the original. Currently, Nintendo has not announced an official release date for the game.